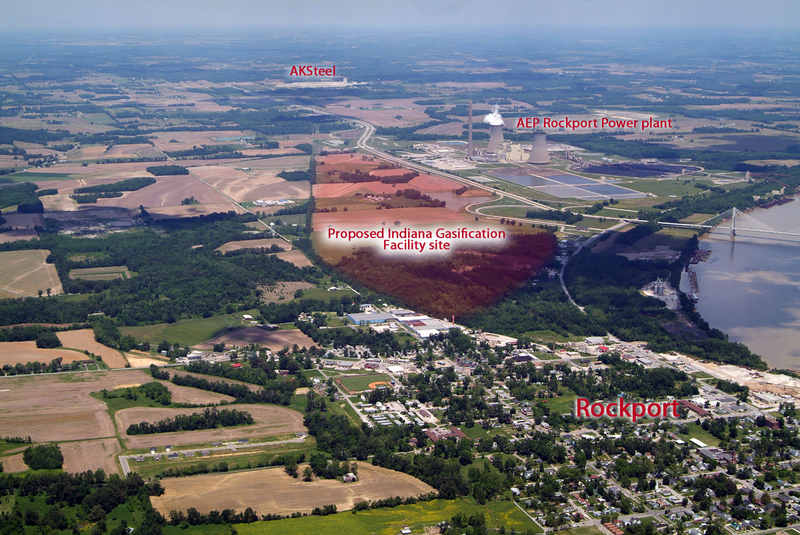 Indiana Gasification wants to build their plant across US 231 from AEP's 2600 megawatt Rockport power plant and just south opt AKSteel's Rockport Works. Those two facilities, together emit more toxic pollution than all the COMBINED industrial toxic emissions of Atlanta, Philadelphia, Pittsburgh, Chicago, Indianapolis, Seattle, Los Angeles and San Diego. Photo © John Blair. They were announced with great fanfare nearly six years ago: plans to build a high-tech plant in Rockport in southwestern Indiana that would use coal to produce billions of cubic feet of substitute natural gas a year for Hoosier homes and businesses. The massive project would save consumers nearly $4 billion over 30 years, said Gov. Mitch Daniels, citing a study by Carnegie-Mellon University. It would help make Indiana “a leader in homegrown clean energy.” The whole project could be built and selling gas by 2011. But instead of being completed, the plant is still on the drawing board, running into growing opposition and awaiting environmental and financial approvals. Meanwhile, the market price of natural gas continues to fall, causing some to wonder if the plant still makes economic sense — especially for Indiana’s 1.5 million natural gas customers. The $2.6 billion project — which would use heat, steam, pressure and oxygen to turn coal into natural gas — is drawing flak from all sides. Consumer advocates say it is a risky gamble that could backfire. Environmentalists bristle at the project’s “clean energy” claims, saying the technology is not cutting-edge, and the plant’s huge appetite for coal will expand mining in a state known for its weak safeguards. And the market price of natural gas has fallen to nearly its lowest price in a decade, raising concerns that a complicated financing formula would force Indiana customers to subsidize the cost of the plant by paying above-market prices for gas to heat their homes. But the project’s owner, New York investor Leucadia Corp., insists the plant is a smart idea and makes economic sense. “We’re actually more bullish than we were a year ago,” said Mark Lubbers, an Indiana consultant for Leucadia and a former top Daniels aide. In its initial push to sell the project, the company won a batch of important victories. It got support from Daniels, the Indiana General Assembly and a raft of state agencies to approve the complex financial structure. That was important, because Leucadia could not find financing in the private sector. Several Indiana utilities took a look at the project a few years ago and balked at the idea of signing long-term orders with the plant. Without their support, Wall Street would not financethe project. That prompted Daniels to get the state involved as a financial middleman. Under the deal, the Indiana Finance Authority would spend about $7 billion over three decades to buy synthetic gas from Indiana Gasification LLC, a subsidiary of Leucadia. The state agency would resell the gas on the national market. Selling the gas at a profit would lower monthly bills for gas customers in Indiana. But selling at a loss would lead to higher bills. But now, after early successes, the project is running into criticism or uncertainty at nearly every turn. Even the governor, who says he still supports the project, is expressing doubts about whether the plant will get critical loan guarantees from the Department of Energy. Without the loan guarantees, bond issuers say they would not finance the plant, and the project would die. In a news conference last week, Daniels was asked whether the Department of Energy would be likely to approve the loan guarantees in the wake of several loan rejections for auto companies, including Carbon Motors and Bright Automotive, to produce high-mileage cars. Both auto companies said they had worked intensely for years on due diligence with the agency and were stunned by the loan rejections. So what might that mean for Rockport? On top of that, the project seems to be losing enthusiasm in the Indiana General Assembly, where support had been solid and deep. Last month, a House committee voted 22-2 to strip tax breaks for the project. That’s a big shift in the conversation from three years ago, when state lawmakers voted overwhelmingly to pass a bill that would allow the state’s finance authority to negotiate long-term contracts to buy and sell synthetic natural gas from the plant. That bill sailed through the Senate by a vote of 48-0 and the House, 90-8. Rep. Ryan Dvorak, a Democrat from South Bend, was one of the few to oppose the bill. When the House committee said no to the tax credits, that set the stage for a bruising, high-stakes battle. But Daniels stepped in and told lawmakers the 20-year tax credits didn’t need legislative approval. The tax credits could simply be considered by the Indiana Department of Revenue at a later time, under an administrative rule. Meanwhile, the plant’s “green” claims are running into opposition from environmentalists, including the Sierra Club, Valley Watch and the Hoosier Environmental Council. They say another energy plant in Southern Indiana will substantially increase demand for coal mining in a state not known for strict regulation. They also question the project’s claims that it will operate with “extremely low emissions” of regulated air pollutants and will capture and sequester carbon dioxide. “It’s a real stretch to characterize this as a cutting-edge carbon capture project,” said Jesse Kharbanda, executive director of the Hoosier Environmental Council. An unfavorable ruling by the U.S. Environmental Protection Agency, which is considering the environmental impact of a special pipeline to move carbon dioxide away from the Rockport plant to buyers on the Gulf Coast. A low rating by a credit-rating agency on the project that could result in high interest rates, making the bonds harder to sell. Problems getting air or water permits from the Indiana Department of Environmental Management. A continued slide in natural gas prices that may cause supporters to reconsider the project. Already, natural gas futures are hovering near a 10-year low, pushed down by mild weather and growing inventories. Critics of the project say that is raising the risk for consumers. In sales on the open market, gas prices routinely rise or fall every day with supply or demand. Even with a weak market, the Rockport owners would always receive from Indiana a firm payment: about $7.57 per 1 million BTUs, or about $7 billion over 30 years. That would cover plan operations, coal costs, shipping the natural gas and loan repayments, and profits. Some energy analysts say the Rockport plant’s developers are betting that gas prices are going to go back up. But is that a smart bet? Last week, natural gas futures on the New York Mercantile Exchange were at $2.27 per million BTUs. “The fundamentals are bearish,” Tom Saal, an analyst at INTL Hencorp Futures in Miami, said in an interview with Reuters. If prices don’t go up, Indiana consumers could end up holding the bag. The contract between Indiana Gasification and the state locks customers into higher gas bills if commodity prices for coal rise while natural gas stays low or falls further. And some consumer advocates say that’s no bargain at all. “This was a horrible deal in 2008 and even worse today,” said Kerwin Olson, executive director of Citizens Action Coalition of Indiana, a utility watchdog group. But the project’s backers say the critics are wrong about the plant’s economics. Lubbers said the gas industry is about to undergo a huge consolidation, with 10 large companies dominating the market. That will end the long slide in natural gas prices, as big players get more pricing power. Even so, the plant has been delayed over and over, which could raise the cost of materials and labor and push up the price tag even more. When the project was announced in 2006, a news release from the Daniels administration put the price at $1.5 billion. Now, nearly six years later, the price is already up to $2.6 billion, and ground has yet to be broken. Lubbers said the earliest the plant could break ground is early 2013. Then it would take about 31/2 years for construction and more time for testing. It could easily be mid-2017 before the plant finally begins selling gas. The big questions: What will be the final price tag on the plant? And what will be the price of gas? This entry was posted in Uncategorized and tagged Coal, Coal finance, Crony Capitalism, Indiana Energy, Leucadia National, Mitch Daniels, socialism. Bookmark the permalink. Keep up the fantastic works guys I’ve added yoou guys to blogroll.